When you go to New Zealand, you will probably go for the great landscape, all the outdoor activities you can do and all the amazing road trips you can make. But lovers of extreme activities will also go to New Zealand to get that big adrenaline rush. You might get it from snowboarding or paragliding, as well as from jumping of some bridge with a bungee rope around your ankle. And what is a better place in New Zealand than Queenstown to do all these sorts of activities and to feel this extreme rush? Queenstown is a small town on the South Island of New Zealand, at the bottom of The Remarkables and next to the 80 kilometer long Lake Wakatipu. With a population of just 10.000 it’s not the biggest town of New Zealand, but definitely one of the most visited. I am pretty sure it has something to do with the location of Queenstown, as the surroundings are beyond beautiful. From every corner of the street you will see the mountains, sometimes with snow on top, the crystal clear water of the lake or both. There are also many activities to do in and around Queenstown. During the winter period the ski areas around town will open their gates for all sorts of visitors, while during summer time it will be the perfect getaway for a relaxed holiday or all other activities. 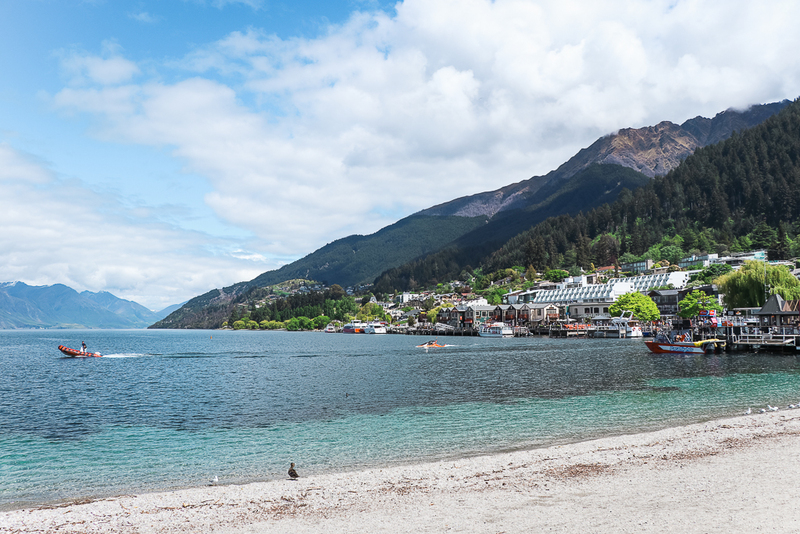 Yes, Queenstown is definitely a place where you can cross off tons of activities on your New Zealand South Island Bucketlist. You can easily reach Queenstown by car by driving the State Highway 6 or taking the bus that gets into town. There is also an airport just outside the town centre that is used very often. Queenstown is also a great base for day trips to Milford Sound in Fiordland National Park and Wanaka for example. The town centre of Queenstown is not big at all, so everything is within walking distrance. If you plan some activities, they will often pick you up at your accommodation, so there is no need to worry about that. The weather in New Zealand can change rapidly and that’s no different for Queenstown. In the winter it gets pretty cold and you can expect some snowfall, although it doesn’t really get below zero degrees in the town itself. During the summer you can expect temperatures of around 20 degrees Celsius and the sun will shine often. Don’t be surprised though if a blizzard is suddenly coming your way when it’s spring or to experience a heat wave during autumn. Just prepare yourself for anything. Keep the best for last right, so we will start with some slower activities. You might think that the town centre of Queenstown doesn’t have that much to offer in the first place. When you look around you will mainly see booking agencies offering tours and packages, hotels, souvenir shops and restaurants. But don’t get yourself fooled. There is so much to do around Queenstown anyway, that there is no need to have tons of things to do in Queenstown centre as well. Just make sure you won’t miss out on these five. Queenstown lies next to the river mouth of the Kawarau River, flowing into Lake Wakatipu. The first thing we noticed when we visited the lake was the crystal clear water and blue color of it. The second thing we saw is that there are a lot of fun things to do on the water. If you want to experience Lake Wakatipu on a slower pace, you might want to join the TSS Earnslaw, a historical steam ship that sails across the lake. But if you are already looking for that adrenaline rush, the Hydro Attack will be your way to get it. Step into a sort of small shark shaped submarine and you will conquer the underwater world on turbo speed and shoot out of the water. You can also go flyboarding, jetboating and more. The town centre of Queenstown is situated next to the Ben Lomond Scenic Reserve, although there is a big difference in altitude between them. To actually get on top of Ben Lomond you will need to take an extremely curved path up, but alternatively you can take the Skyline Gondola. This gondola will take you up the mountain where you can choose to go back down again by ‘luging’. Think Mario Kart and racing down some hills. And of course you will have a splendid view over Queenstown when the weather allows it. I am not 100% sure how this hamburger restaurant has become so popular over the years. But I do have to admit that the ‘Fergburger’ is way too delicious. They actually became so populair, that people are even waiting in line to order one of these burger. So don’t be surprised if you have to wait up to half an hour to get one of those precious burger. It’s worth it. New Zealand is not always the cheapest country to go for a drink and some cities do not have a really exciting nightlife either. That doesn’t count for Queenstown. With drinks for just $ 5,- each and lots of music and fun we had a blast when we went out in Queenstown for one night. Nightlife in Queenstown can be found anywhere around the centre and you don’t have to search for it. There are also some cheaper and good restaurants around town and a lot of cafes where you can sit outside to have a drink. It might have been the fact that we already drove so many incredible roads before in New Zealand, like Arthur’s Pass. The Queenstown – Glenorchy Road is very well known as one of the most beautiful drives in New Zealand. However, we were not that enthusiastic to be honest, but the 90 kilometer back and forth is worth it anyway. Make sure you stop at Lake Wakatipu now and then to soak up the view over the lake and the mountains. When you visit New Zealand during winter time, you can go to a lot of ski areas around Queenstown. The most populair ones will be The Remarkables, Coronet Peak, Cardrona and Treble Cone Ski Area. Everything you need know or to buy to do winter sports in New Zealand, can be arranged in Queenstown. Just keep in mind that a lot of people love the ski season in Queenstown and that you have to book your accommodation in advance. And don’t forget that the winter in New Zealand is the opposite of the winter in Europe or the United States. The ski season in New Zealand will be roughly from mid-June until mid-October, depending on the region you go to and the weather. I am not sure what is more scary, bungy jumping or bungy swinging. The main difference between them is that you literally swing through the canyon when it comes to bungy swinging. Together with another person you will be attached to some wire cables and a swing rope. After that you will fall down and swing your way around. If you do the Nevis Swing you will swing in an arch from around 300 meters. Daredevil you are. Two activities that can’t be excluded from this list are paragliding and skydiving in Queenstown. When you go skydiving, you will jump off the mountain of Ben Lomond Scenic Reserve and end up in a field in the centre of Queenstown. You can straight away go for a drink after it, how convenient. I thought it was rather scary sometimes, as it almost looked like people would hit the road. Paragliding should be an amazing thing to do as the landscape around Queenstown is simply stunning. I am unfortunately to scared to jump (yep, coward here), otherwise I would have done it in Queenstown for sure. Also a really popular Queenstown activity: to go rafting on Shotover River or to jump in a jet boat on the very same river. This river is 75 kilometers long and goes extremely fast at some points! Adrenaline kick guaranteed. So it’s the perfect river to go white water rafting or to enjoy the rapids in a jet boat on a beautiful day. Most of our time in New Zealand we slept in our car on campgrounds, but this was undoable when we were in Queenstown. That’s why we slept at JUCY Snooze for a couple of nights in the centre of Queenstown and we loved it! 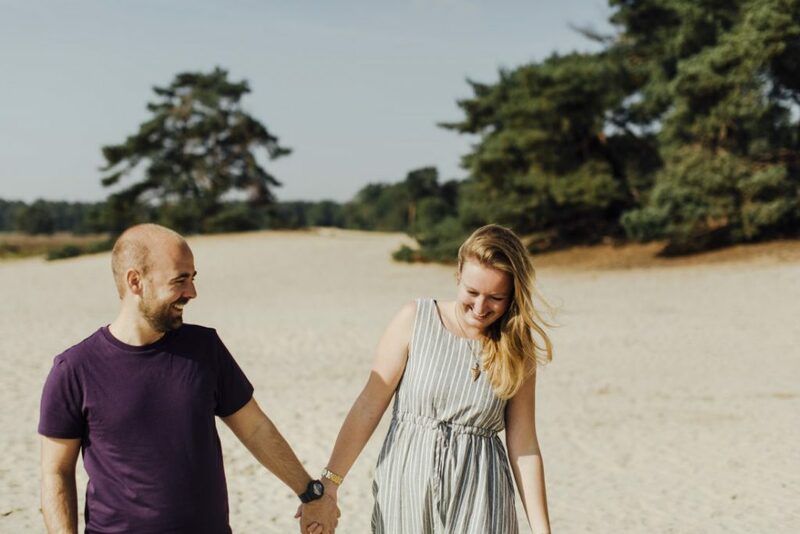 The beds are super comfy, the shower nice and warm and there is a great rooftop bar as well where you can enjoy a pizza and a drink and where they organize activities such as live music. If you are traveling solo or on a budget, they have these awesome, almost futuristic looking sleeping pods with everything you need. Want to take a look at them? Check out the Facebook or Instagram pages of JUCY I would say! This article is partially sponsored as we got our stay at JUCY Snooze in Queenstown for free. That doesn’t change anything about my opinion about JUCY Snooze. It truly is an amazing place to stay in Queenstown and I can highly recommend it.